(NaturalNews) Colon cancer is a particularly deadly form of the disease that is rapidly increasing among those who consume a traditional Western-style diet, which has previously been shown to dramatically raise disease incidence due to a lack of fiber and high intake of sugary, processed carbohydrates. Prior studies have also demonstrated an increased risk of colon cancer with a diet high in red and processed meats. Those studies have pointed to higher levels of dietary iron and nitrates as a primary cause for the disease. 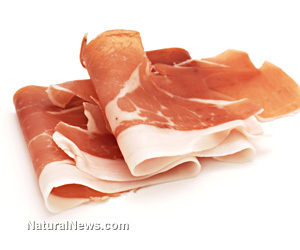 New research just published now shows that eating processed meats promotes colon cancer in one-third of the population through a genetic susceptibility that lowers the innate immune response. A research team from the University of Southern California released the results of a study at the 2013 annual meeting of the American Society of Human Genetics that explain how a common genetic variant that affects one in three people significantly increases the risk of colorectal cancer from the consumption of red meat and processed meat. The scientists identified a gene that raises the risk for colorectal cancer from eating red or processed meat. The study is believed to be the first to identify the interactions of genes and diet on a genome-wide scale. The lead study author, Dr. Jane Figueiredo, noted, "Diet is a modifiable risk factor for colorectal cancer. Our study is the first to understand whether some individuals are at higher or lower risk based on their genomic profile. This information can help us better understand the biology and maybe in the future lead to targeted prevention strategies." The researchers examined 9,287 patients with colorectal cancer and a control group of 9,117 individuals without cancer. Additionally, the team systematically searched the more than 2.7 million genetic sequences for interactions with consumption of red and processed meat. The scientists identified a gene variant known as rs4143094 that significantly increases the risk of developing colon cancer. The variant is located on a chromosome that has previously been linked with several forms of cancer development. The transcription factor encoded by this gene normally plays a role in the immune system, and the variant discovered prevents optimal detection of aberrant colon cancer cells, leading to increased disease risk. Carriers of this genetic variant have been found in 36 percent of the population. Dr. Figueiredo concluded, "Colorectal cancer is a disease that is strongly influenced by certain types of diets. We're showing the biological underpinnings of these correlations, and understand whether genetic variation may make some people more or less susceptible to certain carcinogens in food, which may have future important implications for prevention and population health." In addition to past research bodies that have shown increased risk of diabetes and cardiovascular disease, this study identifies a genetic component that promotes colon cancer. The study yields yet another reason for the exclusion of processed meats from the diet, especially in genetically susceptible individuals.